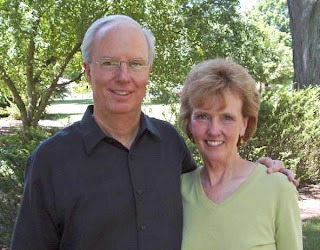 Please pray for Jay and Jan Bell (pictured), who are with Grace Brethren International Missions. The Bells, who were returning to Indiana from relocating their son, Steve, in Colorado, were in an accident Saturday morning in Iowa. According to reports received in Winona Lake, their vehicle hit an icy patch on Route 80 about 10:30 a.m. Eastern time and rolled several times, landing on its side. Both exited the vehicle through the broken windshield. The airbags did not activate since it was not a head-on collision, but the vehicle was totaled. The Bells are currently in the Atlantic, Iowa, medical clinic, being examined for cuts, bruises, and any other injuries. They are, understandably, emotionally shaken, and ask prayers for wisdom in next steps, as they are about eight hours away from their home in Winona Lake, Indiana. They are thanking God for sparing their lives and for sparing them from serious injuries. Preliminary reports indicate that Jay has a concussion and Jan is undergoing tests for the same. The Bells will need to remain for at least 24 hours for observation. A report as of 2 p.m. Saturday (eastern time) was that the Bells will be released shortly. Pastor Randy Todd of the Grace Brethren Church in Dallas Center, Iowa, is enroute to pick them up and to help. Both Jay and Jan have concussions and have been told to “lay low” for 24 hours before getting another rental vehicle to come the rest of the way home. They were driving a cargo van when they hit some black ice and lost control. Jan also has a broken and a bruised rib on her left side. Keep them in your prayers, please.